Work appears to have stopped long ago on renovations to the Forrest Block building at 4th and Brady streets in Davenport. Renovations never quite made it to the Forrest Block building at 4th and Brady streets. Yet this sign still remains, reminding thousands of downtown passers-by of what’s not being done in downtown Davenport. It’s a shame this senseless sign remains, because it distracts from all the great stuff that is being done downtown. A firm called Highland Brothers, headed by Scott Reimer and represented by registered business agents Priester and Shie law firm located two blocks north on Brady, had big plans in July 2006. Tax credits would help fund renovation of this longtime Davenport eyesore. The company’s 2006 news conference promised a $2 million renovation into 10 luxury condos over first-floor commercial space. Yet there’s little evidence any work was done. The firm bought the building for $130,000 in 2005. The building’s assessment was $79,900 this year. City records show the last building permit was for a roof in 1998. Highland hasn’t sought any building permits for the project, according to city records. A lien remains on the property for a $41.50 snow removal bill from the city. Representatives from Highland could not be reached. 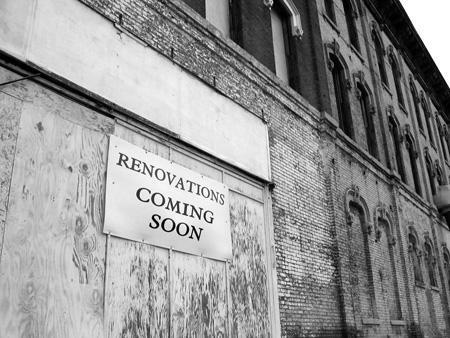 Lots of things can derail ambitious historic renovation projects. But there’s no reason for this sign to remain at a heavily traveled Davenport intersection. We hope this senseless sign comes down until the owners can deliver on their promise.